The Flower Matrix Papers by Claudia Hart (2017). Photo by the artist. “Amorphous Ball” by Joseph Farbrook (2017). Photo: Boston Cyberarts. “Skywrite” by Will Pappenheimer (2018). Photo courtesy of the artist. Inspired by our dreams and powered by our imagination, augmented reality explores visions of what lies just beyond the real. Simply put, augmented reality (AR) layers computer-generated sound, video, or graphics into a real-world environment. Think of it as art in the form of virtual snowflakes — the surreal and the hyper-real dovetailed. These visceral, even sensuous, mirages may connect with reality, may stand on their own, or may partake of both worlds. Boston Cyberarts’ exhibit Now You See It…. 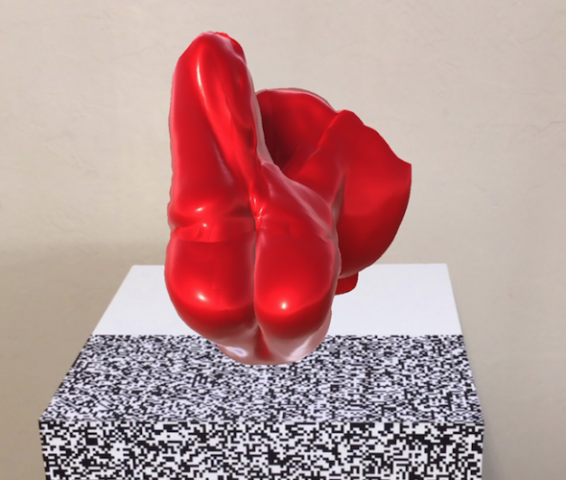 (through May 13) includes works by five prominent and pioneering augmented reality artists. Joseph Farbrook’s Amorphous Ball (2017) is a shape-shifting red sphere that can assume an infinite number of forms. Carla Gannis’s The Selfie Drawings (2015) is a book of 52 digital drawings completed over 52 weeks in which the artist performed “the self” via digital drawings and augmented reality. Claudia Hart’s selection of works from The Flower Matrix creates new kind of liminal space. Hart supplies a seductive environment for viewing her immersive world: technology has replaced nature, both sugary sweet and chemically toxic in equal measures. Michael Mittelman draws on mixed reality to create digital Sol LeWitt-like drawings on the walls of the gallery. And Will Pappenheimer presents Waters Rising, which generates the illusion that the gallery is slowly filling with water, until viewers feel they are trapped in a distorted underwater world. Concurrently, the Institute of Contemporary Art is presenting Art in the Age of the Internet, 1989 to Today (through May 20), a show that explores the various artistic applications and approaches to contemporary visual and performance art. The ICA thoughtfully coordinated with other Boston area institutions and museums so that this exhibit is connected to other related exhibitions and programming. An earlier related Boston Cyberarts exhibit shown in January — Artificial Intelligence (AI) — was one of the 14 partners’ exhibits or events among the ICA’s Art+ Tech Collaborative. The ICA exhibit examines how the internet has radically changed visual art, specifically in its production, distribution, and reception. On view is a broad range of works across a variety of mediums — including painting, performance, photography, sculpture, video, and web-based projects. The works in show investigate the extensive effects of the internet, not only on individual artistic practice, but on culture. The ICA exhibition is accompanied by a major scholarly publication and web platform. Over the last year, Boston Cyberarts has been involved in a series of augmented reality exhibits and events. In each instance, they have been uniquely site-specific. Inspired by the historic City of Salem, Massachusetts (from May 27 through November 30 2017), Boston Cyberarts presented The Augmented Landscape at the National Park Service’s Salem Maritime National Historic Site. Located on the city’s historic waterfront the project featured eight augmented reality “sculptures” created by four internationally-acclaimed artists — John Craig Freeman, Kristin Lucas, Tamiko Thielm and Will Pappenheimer. Each one of the eight artworks investigated various relevant topics related to both Salem and the oceans. Works focused on such important issues as East-West relations, New England’s maritime connections with Russia, Japan, and China, American idealism, the discord between globalism and isolationism, piracy as warfare, and the effects of climate change, global warming, and rising ocean waters. This year, through May 20, Boston Cyberarts is assisting Newton, MA in a celebration of its 13 villages with Skywrite Newton, an augmented reality skyart/skywriting project. The artwork has been created by artist Will Pappenheimer. 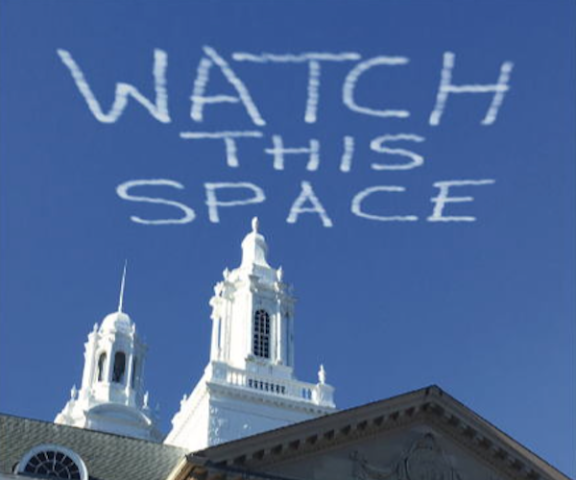 Viewers, through the use of smart devices, can view the sky above each village and read a Skywrite phrase. Thorough instructions are available online to help viewers see the evidence of the project and to document them. 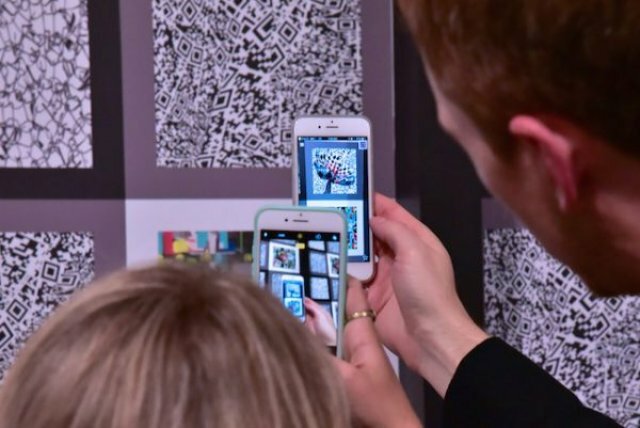 The Boston Cyberarts-sponsored series of augmented reality exhibitions and events has generated a wonderfully stimulating visual and cultural conversation about what was, what is, and what can be art in the 21st century. These investigations into art and technology aim to take us out of ourselves, to enable us to perceive the environment around us in radically different ways while generating considerable wonder and delight.